Quilting and Life in General: Alaskan Cruise - Day 2!! Alaskan Cruise - Day 2!! We had set the alarm for 8! Ha, dreamers! Bad night, I slept like my DH! We got up early for breakfast and then "North to Alaska" for us. But first, a side trip to Bayside Quilting. I've been following them in ads and online for years. Don't you just love their logo?? I've always been fascinated by "Rosie the Riveter!! One of my missions (yes I have more than one!!) was to find a birthday present for Miss P, my granddaughter who turns 9 in September! Asking directions for the farmer's market headed us the wrong way, so we got sidetracked into a flea market and U found a great jewelry box for P!! HooRay! AND I got a sewing tray too! Here's a preview of how much she liked it!!! 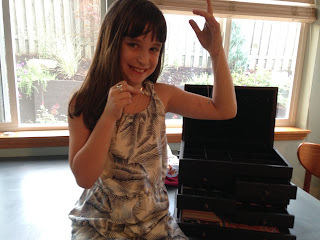 Her hands are showing the 2 necklaces that were in the box. More on her birthday later - I promise. Time to get on with the cruise. The docks and parking is W*A*A*A*A*Y downtown and guess what - the biggest party yet! Holey Moley! I had to stop at a rest area to unclench my hands! But we found it and was still on schedule. We boarded the ship about 1:45 and our room was ready. HooRay! The room is small, but we will make it work. After all, we're ARE ON the ship!!! Here it is - our home away from home for the next week. It's big and confusing!!! U swears we walked over a mile today on the ship - mostly going the wrong way!! The Westerdam is big but completely different feel than the Independence of the Seas. (My only other cruise. To the Caribbean via Royal Carribbean.) That 2 deck promenade made a lot of difference. I'm sure I'll get used to it. After dropping our stuff in the room, we went to lunch on the Lido deck; I had salad and ice cream (no judging) we joined M (91 today) and L (?) from Australia. They are a hoot. Ran into them again at the "Cast Off party"
It's exciting to start off on our great adventure, it's windy on deck when we are underway! We looked back on the beautiful skyline of Seattle but there's smoke from all the fires, so not a good picture. Next time. We have the flexible dining plan, and tonight we had a table of 6 for early dinner in the second floor dining room. We sat with M&L - she's a quilter from Portland and C&R from Texas. M&L are celebrating their 50th anniversary. R did his thesis on Climate Change, it was so interesting to talk with him. Our dinner was awesome. Alaskan seafood chowder; roast chicken and baked Alaska. I didn't like the Baked Alaska - mostly meringue, tiny brownie, not much chocolate - totally not worth it. Good to know. Hmmm, the ongoing mission of finding the best chocolate desserts!!! After dinner, we went to gift shop; I bought a book about Alaska and some postcards to send to the kids. Then we went to the BB King nightclub. I bought drinks tonight. The Strong Island Ice Tea wasn't very good. Ulli brought her bottled beer back to the room. The jazz group was pretty darn good. We had dancers from the audience for the last couple of songs. Then we went on to the Vista Lounge for the main show. Really good juggler. Mike Price, the Rock Star Juggler!!! He invented some laser gloves so the audience could see the hand pattern. He was great and funny too! But they added smoke to show off lasers and it got to my eyes. Oh, well, still liked him. So far cruise director isn't as funny as IOTS's!! But lets give him a chance. I'm off to bed. It was a great first day. All that traffic really made getting on the boat feel like the start of vacation!! And it is!! I am loving this trip along! Come along on a cruise with me! !